Book a ferry to Dover with AFerry. Ferries to Dover, in England, are available from France. You can take a ferry to Dover from Calais and Dunkirk. DFDS sail up to 15 crossings per day with a sailing duration of 1 hour 30 minutes. 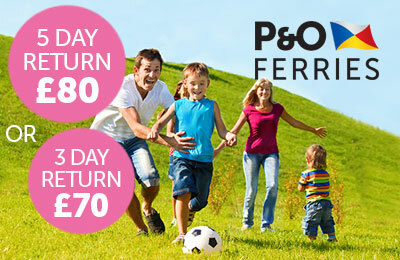 P&O Ferries sail up to 24 crossings per day with a sailing duration of 1 hour 30 minutes. The average price this week for a car and two people return is £23 per person. Sail with DFDS. Travel from Dover to Dunkirk or Calais for a short break to France. 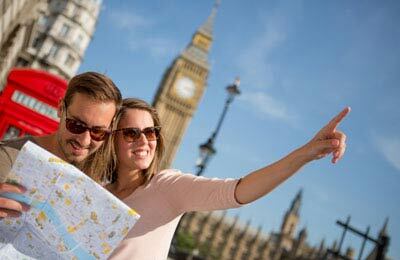 Save up to 40% compared to regular fares! Take your car & up to 9 people. 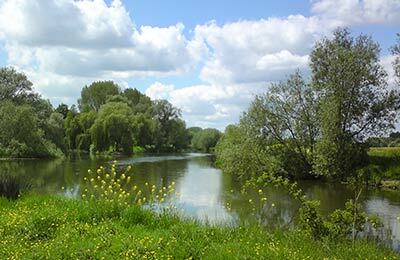 Catch a fantastic ferry deal for the perfect spring or Easter short break to France. Now is the perfect time to explore the stunning French coast and countryside. Plus enjoy the flexibility of returning on either route, no matter which route you sailed out on. Click here for terms and conditions. Sail with P&O Ferries. Take your car & up to 9 people. 3-day breaks from just £70 return (Mon-Thur) and £75 return (Fri-Sun). 5-day breaks from just £80 return (Mon-Thurs) and just £85 from (Fri-Sun). Click here for terms and conditions. Ferries to and from Dover are operated by DFDS and P&O Ferries. Because 2 ferry companies operate in and out of Dover, comparing can be very useful to help you find the best price at the best time for you. When you search for a ferry to Dover, we will always show a range of times just in case it's cheaper earlier or later than the time you select. We'll also show you results for similar ports like Folkestone to help you find the best times and prices to suit your plans. Dover ferries with DFDS and P&O Ferries are known for their comfort and high levels of service, and you will feel like your holiday has begun the moment you step on board. Travelling to Dover will be easy and hassle free. Start by making your booking today, it's quick and easy. In the ferry port of Dover you will find a currency exchange office, Cafe Ritazza, a Burger King and several outlets at the Eastern Docks. At various places in the ferry terminals you will find unisex toilet facilities for disabled people. The Dover ferry terminal consists of 6 main areas: the Travel Center, the boarding lounge for foot passengers, the arrival hall and three passenger buildings with various facilities such as Cafe Ritazza, a Burger King, the Barnacles Bar, as well as several snack bars, toilets (including disabled toilets), showers, baby changing room, public telephones, vending machines, car rental Europcar & Avis, a children's play area, the National Westminster Bank and a exchange office. Near the entrance to the Eastern Docks is also a BP petrol station. In addition to the ferry terminal parking facilities for short and long-term parking are available for a fee. In the parking garage you will find parking spaces for disabled people on the first two levels. With the lift you can then go to the Travel Center to check in. Dover is located about 112km south of London, directly linked to the M2 / A2 and M20 / A20, which are connected to the M25 motorway. From the M2, follow the A2 motorway and the M20, follow the A20 towards Dover. Then follow the signs for the Eastern Ferry Docks. There are regular trains from London Victoria or Charing Cross to Dover Priory. The journey time is 1 hour 45 minutes. There is a shuttle bus every 20 minutes (between 7 am and 10.30 am) between Dover Priory and the Ferry Terminal. National Express coaches connect Dover to Victoria Coach Station in London. The journey time is 2 hours 30 minutes. If want to stay a little longer in or around Dover, visit our accommodation page for the best prices and one of the largest selections of hotels / B&Bs available online! New bookings only. All offers are subject to availability. Standard terms and conditions apply. Amendment charges may apply and card charges apply to some card types. All dates refer to the current year unless otherwise stated. Prices given are from prices only and subject to change. Prices given are based on the standard vehicle measurements for each ferry operator. Offers may be withdrawn at any time. Offer is available on return bookings only for cars 2.35m high and up to 9 people and motorcycles / motorcycles with side cars with up to 2 people. Outward journey must start in Dover. Prices are subject to availability and offers may be withdrawn at any time. You must return within 1, 3 or 5 days of departure. Offers are valid for bookings made by 14-Dec-18, for travel from 21-Mar until 15-Dec-18. Exclusions: 13-16 Apr, 24-26 May, 01-03 Jun, 01-Jul to 03 Sept, 19-20 Oct and 28 Oct 2018. Bookings are subject to restricted space, sailings and dates. Bookings must be made at least 2 days before departure. Tickets cannot be amended within 3 days of travel. Excludes Motorcycles and trailer/sidecar combinations, minibuses, motor homes, special vehicles, vehicles designed for commercial use and caravans/trailers. P&O Ferries reserve the right to amend or withdraw all elements of the promotion without prior notice. Subject to availability.